You are here: Home / On The Court / trophy watch / trophy watch: llodra keeps his clothes on, venus makes her case, roddick hits back, etc. 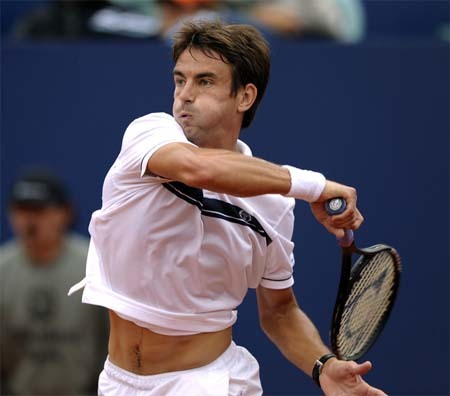 Robredo rolls: Spaniard Tommy Robredo has been slowly compiling a successful 2009 (he’s 15-3 in match wins so far), adding to last week’s Brasil Open title a trophy from the Copa Telmex in Buenos Aires. 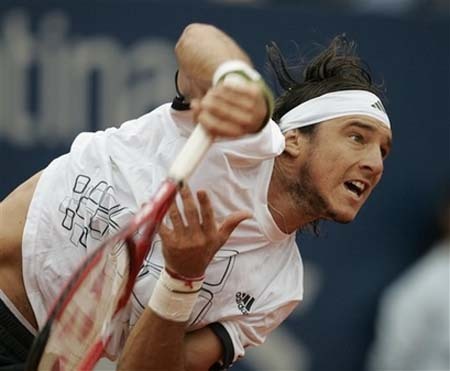 As a part of a nine-match winning streak, Tommy took out 2007 champ Juan Monaco 7-5, 2-6, 7-6 (5). Roddick’s revenge: Early bird got The Worm this week when Andy exacted revenge on Radek Stepanek‘s title win over the American at last week’s SAP Open. This time around, at the Regions Morgan Keegan Championships, the top seed only needed two sets to take out Stepanek: 7-5, 7-5. As you may have heard, Roddick is skipping this the ATP Dubai stop in support of Shahar Peer. Good for him. Teenage triumph: And on the women’s side of this combined tournament, Belarusian Victoria Azarenka upset top seed Caroline Wozniacki in the finals of Memphis 6-1, 6-3. This is Victoria’s second title of the year (and of her career). 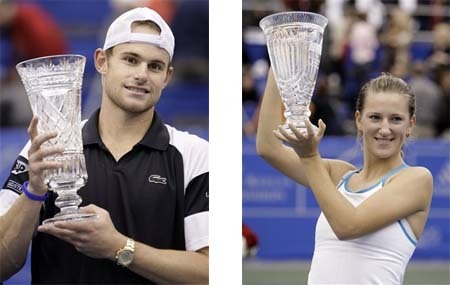 She was merely playing catch-up to Wozniacki, whose breakout 2008 produced three titles. 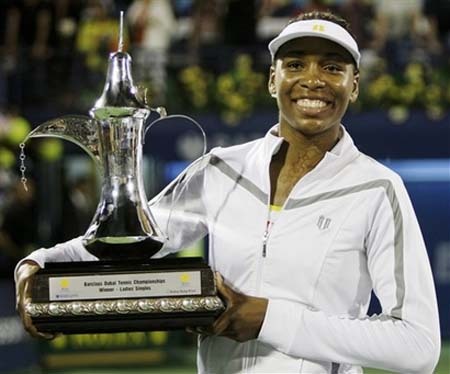 Venus and Virginie: Speaking of Dubai, a gracious (and henna-free) Venus Williams addressed Shahar’s situation during her trophy ceremony after beating Virginie Razzano 6-4, 6-2. Props to Virginie and Asics for maxing out her airtime. They had her in another colorway of her separates, this one in black with pink trim. French fracas: We’re a little sad that the French smorgasbord in Marseille has come to an end (Arnaud Clement, Youzhny, Tursunov, Dimitrov, Vliegen, Seppi, Safin, Chardy, Bolelli), and even sadder that Jo-Wilfried Tsonga denied us a post-win striptease from runner-up Michael Llodra. 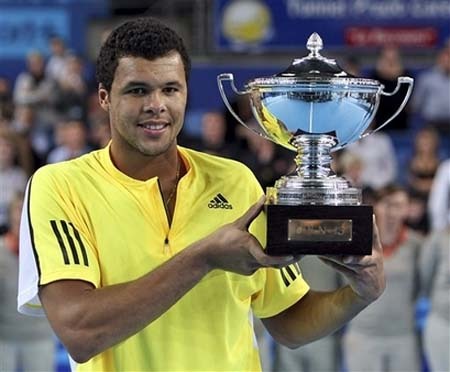 But thumbs-up to Tsonga for bagging his second title of the year. 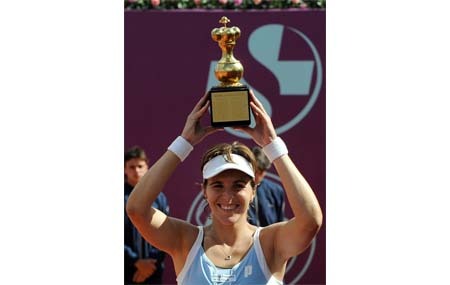 Maria’s maiden title: In Bogota, Maria Jose Martinez Sanchez beat Gisela Dulko 6-2 6-3 for her first SEWTA title at the Copa Colsanitas tournament.